Fibre Snacks are delicious chewy bars packed with chocolate and peanuts, that allow you to snack smart without compromising taste. These healthy, gluten-free snack bars are loaded with fibre and protein to satisfy cravings and promote a balanced digestive system. Every Fibre Snacks bar contains both soluble and insoluble fibre, which help aid digestion while contributing to satiety. Fibre Snacks are available in delicious Peanut Chocolate Chew flavour. Great for those on the go as a quick, convenient and nutritious snack. 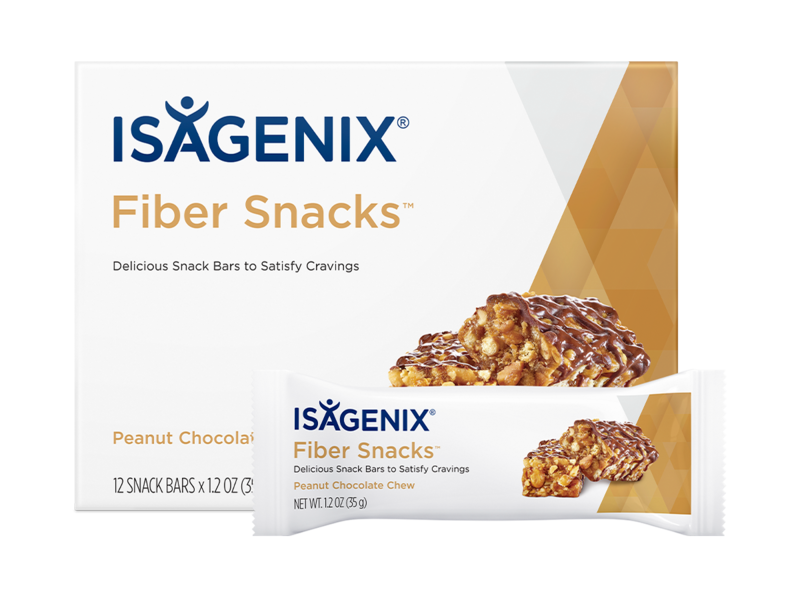 How can Fibre Snacks be used with an Isagenix Program? At 150 Cal per serve, Fibre Snacks should be eaten as a fibre and protein-rich snack to satisfy hunger between meals on Shake Days. If you are looking for a meal alternative, IsaLean™; Bar and IsaLean™ Shake are great options. If I use Fibre Snacks and Slim Cakes together, will I be getting too much fibre? Most men and women fail to reach the recommended daily fibre intake. You can get 6 grams of fibre from one Fibre Snacks and 5 grams from one Slim Cakes™ which together will not exceed your daily recommended intake of fibre. How do Fibre Snacks differ from Slim Cakes? Fibre Snacks contain prebiotic soluble fibre and insoluble fibre from sources that are gluten-free. Slim Cakes cookies contain heart-healthy soluble fibre from oats and insoluble fibre from wheat, which both contain gluten. Why was protein added to Fibre Snacks? Similar to fibre, protein also helps to satisfy hunger, so you eat less and stay full, longer. Protein also promotes muscle growth and maintenance, while providing essential amino acids, the building blocks for the body’s cellular proteins and enzymes. With filling fibre and protein, these snacks help curb hunger and keep you satisfied between meals, so you don’t overeat.